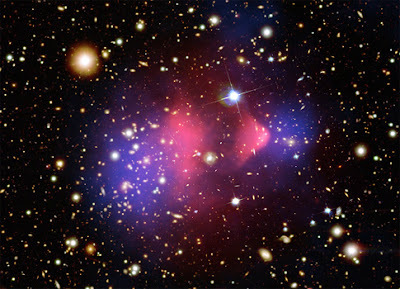 What you see above is an image, made by Chandra, of two colliding clusters of galaxies. The red areas at the center of the image are normal interstellar gas heated by the collision. The outer blue areas are the first visual evidence of the "dark matter" that theorists have posited as making up most of the mass of the universe. The dark matter is not heated because units of such matter do not interact with each other or with normal matter in ways that generate heat. The dark matter is detected by gravitational lensing; that is, by the distortion of the light from more distant objects behind it. I found this image, as in my earlier "Galactic Greetings" post, through a link in Cosmic Log. This link took me to a post of the "Top Ten Astronomy Images of 2006" in a superb blog called Bad Astronomy. The other images are well worth perusing. No, not the weapon. On New Year's eve, we had some friends over for dinner and to watch the fireworks from our roof. My wife suggested that I play some James Brown, so I dug out my Roots of a Revolution, which documents his early years with King Records in Cincinnatti, backed by the first version of the Famous Flames. After that played, our guests were in the mood for more historic R&B, so I put on the third disc, "Things Have Changed 1951-1955", of a superb collection, Stompin' at the Savoy, which includes jump blues and R&B cuts released on the Savoy label from 1944 to 1961. The first cut on the "Things have Changed" disc happened to be "Good Lovin'" (not to be confused with the song released in 1966 by the Young Rascals) by "H-Bomb" Ferguson, a jump blues with a bellowing vocal backed by a snazzy band. The singer's name elicited some curiosity; all I could say was what I had read in the booklet accompanying the disc: that he was a blues shouter who recorded for Savoy in the early 1950s and had a style reminiscent of Wynonie Harris. The nickname came from Savoy producer Lee Magid, who said Ferguson's "voice could shake a room." This morning I was reading an article by Will Friedwald in the arts section of the New York Sun inspired by a forthcoming Highlights in Jazz concert at the Tribeca Performing Arts Center, featuring the great alto saxophonist Lou Donaldson. Friedwald's article stresses the importance of Donaldson's roots in blues, and notes that, when he settled in New York after World War Two, he "began to study music seriously, working extensively with R&B singers such as H-Bomb Ferguson and Larry Darnell and touring with Wynonie Harris." I figured that encountering references to the same relatively little-known R&B artist twice in three days must signal kismet. These days, kismet leads me to Google, where I learned that H-Bomb left New York in the late 1950s for Cincinnatti, where he, like James Brown, recorded for King Records. When his recording career didn't take off like Brown's, he continued to perform live, but didn't make a CD until 1993's Wiggin' Out, which took its name from his late career habit of performing in brightly colored wigs. You can hear a sample of "My Brown Frame Baby", from that album, here. My Google search also uncovered this amazing list of "bomb songs" (including H-Bomb's 1952 "Rock H-Bomb Rock") compiled by an outfit called Conelrad (remember the original?) in a multi-disc collection called Atomic Platters - Cold War Music from the Golden Age of Homeland Security. Click on any song title to get a short account of the artist and history, along with the lyrics. For example, here's "Jesus Hits Like an Atom Bomb" by Lowell Blanchard and the Valley Trio, and here's the scarifying "When They Drop the Atomic Bomb", by Jackie Doll and his Pickled Peppers. My research on Mr. Ferguson came to a sad conclusion with this item from Variety, noting his death just over a month ago.